We really do need you! Cheerful, patient and friendly ? Why not volunteer with Canterbury Oast Trust? We urgently need new volunteers to join our welcoming teams in Aldington and Woodchurch. No experience required, just your enthusiasm and energy! 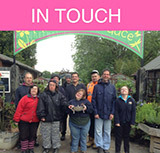 Canterbury Oast Trust is a thriving community organisation. We have some wonderful volunteers who support our work and we are always looking for more people to join us. If you would like to be part of our amazing charity we'd love to talk to you about how you can get involved. What would you spend your time doing? One person's time for a couple of hours a week can make a big difference. Your time could be spent caring for our animals at the Rare Breeds Centre, supporting our woodwork training at Poulton Wood, lending a hand with computer skills at Harrington College or supporting our teams working in care or fundraising. It just depends on you and how you'd like to spend your time.No particular experience is required. We ask that you support our charity's aims for adults with learning disabilities to live independently and take control of their lives. We aim to tailor volunteers' interests to various roles and we can provide training and travel expenses. Whatever time you have to give we are sure you will find working at COT a rewarding experience. It's a great chance to meet new people and expand your own experience and abilities. Please be advised you must be over 18 to volunteer with us.